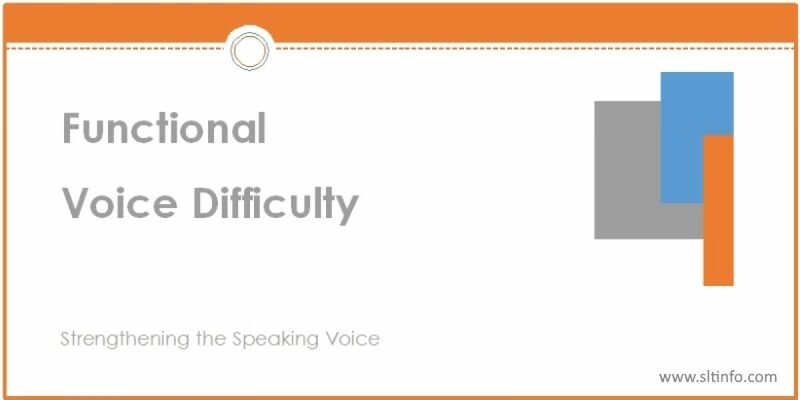 Referring to the information leaflet (written out immediately below and downloadable at the end of this page), a brief explanation of functional voice difficulty should be provided. The leaflet sets out the following information. Functional voice difficulty is explained as a voice difficulty in which the voice quality is poor without any obvious anatomical, neurological, or other organic difficulties affecting the voice box. Symptoms and causes are explained. What the client can do to improve their voice difficulty is described, together with a summary of the improvements they can expect. The information leaflet is quite detailed, and clients will most likely need to go away and read it in their own time. However, a brief explanation that emphasizes that it is a voice difficulty that manifests itself in the absence of any primary anatomical, neurological, or other organic difficulties should be given . Discussion of the information contained in the leaflet can serve as an ‘ice-breaker’ and help the clients get to know each other (see Running Groups). Functional voice difficulty is the name given to a type of voice difficulty in which the voice quality is poor without any obvious anatomical, neurological, or other organic difficulties affecting the voice box. Functional voice difficulty typically affects women more than men and is probably one of the most common voice difficulties. There are a variety of symptoms and, again, these differ from person to person. However, some of the following are typical. Rather like the symptoms above, the causes will vary from person to person. However, the following (in no particular order) are known to contribute to functional voice difficulties. High-risk occupations Teachers, people who work in call centers, sales representatives, and others whose jobs have high vocal demands are at risk. If the place in which you work has a lot of background noise this often leads to you straining the voice in order to be heard. “It’s just the way I’m built” Just as some people are natural athletes and others aren’t, some people’s voice boxes are better able to perform certain vocal tasks than others: everyone has their own limitations. Stress/anxiety This can make a functional voice difficulty worse. The effect varies from person to person and depends on your personality type: some people are more extrovert than others; some people cope better with stress than others. Poor vocal technique Most people cope with a poor vocal technique for short periods of increased vocal demands, as long as they have enough time to recover. If the vocal demands continue for too long, however, or are too intense, this can lead to difficulties. Irritants Exposure to dust, fumes, chemical agents and smoke – as well as smoking yourself – can all lead to difficulties. Acid reflux (heartburn), certain medications and allergies may also affect the vocal cords. Throat infections It is not uncommon for people to experience functional voice difficulties following a heavy cold or flu, and laryngitis. Compensation People who have functional voice difficulties can often get into a habit of repeatedly forcing the voice to make themselves heard, in order to compensate for their poor voice quality. This can sometimes lead to organic changes, such as vocal cord nodules, polyps, cysts and laryngitis: your voice therapist will be able to tell you whether or not you have developed any of these. As the causes and symptoms of functional voice difficulties vary so much from person to person, it’s not possible to predict that you will be able to improve your voice 100%. However, experience shows us that, by following the advice contained in this course, it is likely that you will increase the flexibility and strength of your voice and that you will be better able to manage any potential difficulties in the future. Many people with functional dysphonia engage in compensatory behaviors that can sometimes lead to organic changes, such as vocal fold nodules, polyps, cysts and laryngitis. If any group members exhibit such secondary organic lesions this will likely need to be discussed and explained.